Served by two high-speed platter lifts, Twin Lakes Headwall provides 600 Acres of skiing terrain that varies in pitch from 15 Degrees to 50 Degrees. (Steep!) The summit elevation is 10,900 ft. with 1,000 vertical feet of lift serviced terrain. Surrounding areas offer 3,000 vertical feet of shuttled or hike-in backcountry skiing and riding. We offer some of the best steep headwall and cornice skiing around. 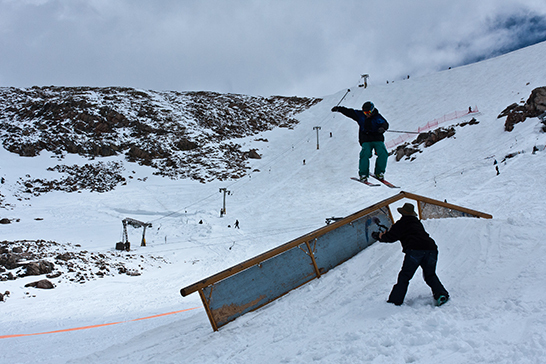 This summer we will be hosting a FWQ 2 Star Comp and an IFSA sanctioned Junior Big Mountain Competition (see Events). Teams and Groups can rent hill space for ski racing and mogul training through the season. Contact us today to see if space is available for your group. Coaches and Group Leaders, contact us to find out about special group pricing!